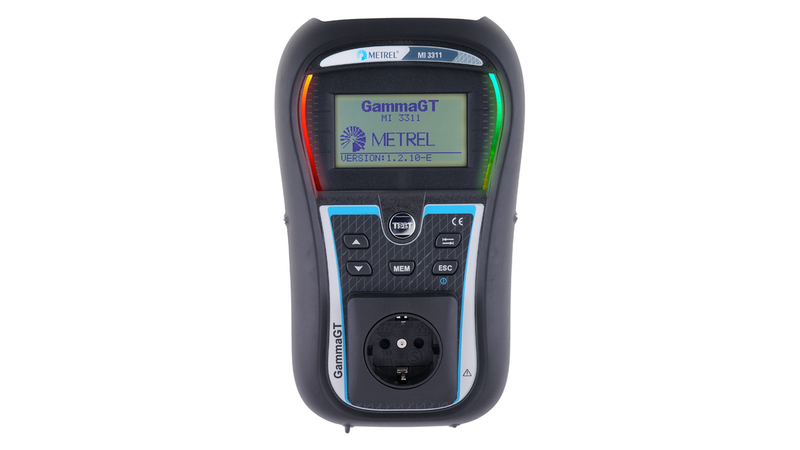 The new MI 3311 GammaGT is a battery powered multifunctional instrument intended to per-form measurements for testing the electrical safety of portable electrical equipment. Due to large graphical LCD with backlight, two PASS / FAIL LED indicators and HELP screens for each measurement the handling of the instrument is clear and simple. Up to 1500 test results with parameters can be stored in the internal memory of the instrument and then downloaded to the PC for further data handling and creation of test report. Lightweght design, pre-programmed and custom test sequences, optional barcoding system and built-in calibration unit make the MI 3311 an ideal instrument for high volume professional safety testing of portable appliances.Key features:- Graphic LCD with resolution of 128 x 64 dots, with backlight.- The graphic display offers easy reading of results, indications, measurement parameters and messages.- Large green and red lights for additional PASS / FAIL indication placed at the sides of the LCD.- Large data flash memory for storing test results & parameters (about 1500 tests can be stored in average).- Two communication ports (USB and RS232C) for communication with PC, and barcode reader.- Built-in real time clock.- Barcoding system for quick test code selection and identification of DUT- Programmable limits for PASS / FAIL evaluation.- Fully compatible with new Metrel PATLink PRO PC software package (download, view, print and export of test results)- Optional PC SW PATLink PRO Plus (advanced test result analysis and professional test report creation)- Built-in calibration unit (checkbox).- Portable and lightweight design.- Rechargeable battery powered instrument with built-in charging circuit.